TigerVPN was founded in 2011 in Slovakia. It was created by Tiger at Work & Co. around eight years ago. TigerVPN prides themselves on having amazing usability. But how about the rest of their services? Are they private and secure? Are their servers fast? Are they well encrypted? I’ll be answering those questions in this review. I’ll also be laying out the pros and cons of their service to let you know if I recommend them as a trusted VPN provider or not. First, however, let’s provide a bit of background on the company so you can see if you can trust them. 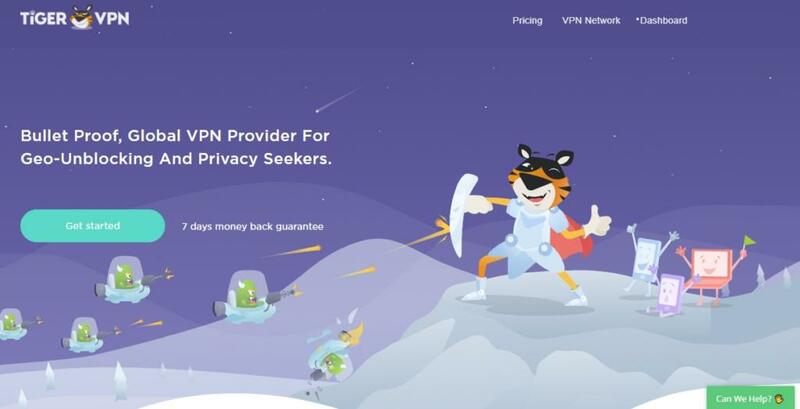 Upon my first visit to the TigerVPN website, I noticed the amazing illustration art on their homepage. The purple color theme (and tiger mascot) are recurring themes across all pages of the site. Clearly, the company values their appearance and brand image. It’s clean, neat, simple, and easy to navigate. Here’s what TigerVPN has to say about themselves on their site. They also explain exactly why they’re called “TigerVPN.” The company donates 2% of its profits to NGO’s that care for animals. This is pretty unique and special for a VPN service. They claim to help animal shelters, fund sterilization programs, and pay for adoption ads. TigerVPN is all for a good cause. So if you’re looking for a socially conscious VPN provider or you’re a huge animal lover/advocate, this is the one for you. Again, this is all well and good. 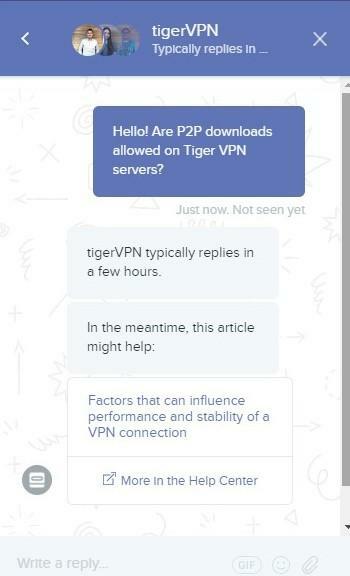 But how private and secure is TigerVPN? How well does it perform at its sole purpose: providing a well-encrypted network to keep your information safe? And can you access Netflix and other streaming sites with TigerVPN? In the pros and cons below, I’ll lay out the results of my own speed test. Before we get to that, let’s look at what other people have to say about TigerVPN across the web. Overall, the conversation seems to be all about how easy to use and private TigerVPN is. However, the article states that it is sponsored content. So how legit is it? Well, for starters, since TigerVPN is located in Slovakia, the company and its servers are subject to a few informal challenges. Slovakia is relatively free of censorship, but there is a lack of legal framework for websites to be completely private or free to express views that may challenge the government. Basically, the government can ban content that it finds questionable or defamatory. All in all, Slovakia has a relatively uncensored internet that encourages free speech and press. But online media in the country is still subject to be criticized or controlled by politics. Before we move on to pricing and speeds, let’s dive into TigerVPN’s features. One of the first things that TigerVPN mentions in its website is military-grade encryption, no logs, and strong protection. They also have native apps for all of your devices, so you can rest assured that this VPN will work no matter the device you’re downloading it on. And since the apps are made with each operating system in mind, ease of use is pretty much guaranteed. TigerVPN works simultaneously on two to five devices. You’ll get access to two devices on the monthly plan. This number increases up to five with the yearly plan. This is a bit of a strange way to break up pricing and features, but it gives you a greater incentive to commit to TigerVPN over a long period of time. I’ll break down pricing in the next section below so that you know exactly how each plan works. This VPN provides 300+ servers in 42 countries. That number puts them about mid-range with the other VPN providers I’ve seen. Some might only offer a dozen or so, while others, like CyberGhost & ExpressVPN, offer thousands. So TigerVPN is somewhere in the middle. Unfortunately, a kill switch is not available for every native app. According to this 2016 Reddit post, a kill switch only works in the Windows App, which is a huge letdown for Mac, iPhone, and Android users of TigerVPN. Kill switches are a priority when it comes to privacy. They detect when your network connection is about to go out, and they terminate your current browsing session to keep your information secure. I really wish that TigerVPN offered this extra layer of protection. Now, let’s go over how much this VPN is going to set you back. TigerVPN has some awesome features, especially around privacy and security. Let’s go over what they’re doing right before we talk about what they can improve on. While TigerVPN might have a lower number of servers, I was pleased to find that they do have excellent encryption options. Here’s a quick recap. TigerVPN offers the industry standard 256-bit encryption. This is top-of-the-line strength, and it’s as secure as encryption gets in this day and age. As of right now, no one can crack through 256-bit encryption, even through a brute-force attack. It is essentially military-grade encryption. Torrenting is allowed with TigerVPN, but it isn’t exactly encouraged by the company. I know, kind of an odd stance. So take this with a grain of salt. I was curious to see if a VPN running in the taskbar would be more efficient or more difficult to use than normal. Fortunately, it’s definitely more efficient in this case. To open the service, just click the TigerVPN icon in the taskbar. Then, a list of servers will appear. Once you’re connected to the server of your choice, the platform will notify you. Just turn the switch to off to disconnect to a server, and that’s all there is to it. There’s no tricky navigation, here. Overall, I’d give it a 9/10 for usability. This is a top-of-the-line interface. 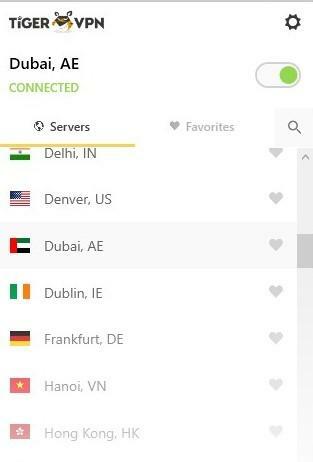 TigerVPN offers an array of customer support options, including live chat and a ticketing system. Just click the “Can We Help?” icon on their website to contact them. 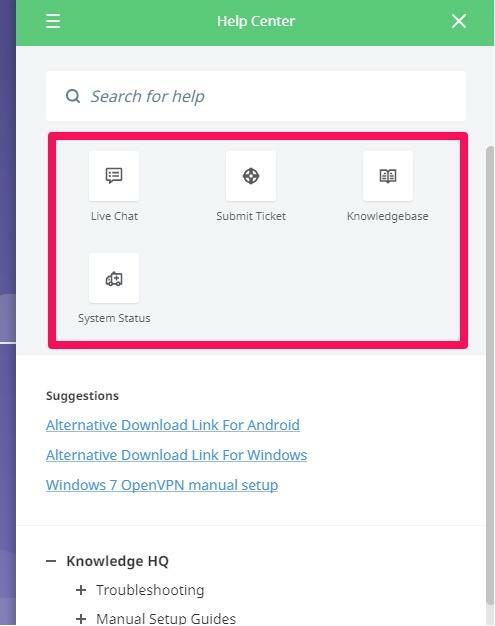 The Help Center will then appear, where you can search for help or use a live chat, ticketing, knowledge base, or system status tool. You’re guaranteed to find the answer you’re looking for. I tried out the live chat feature and was pleasantly surprised. Immediately, I was met with an article link that could help answer my question. I also tried out the ticketing system, just for fun. I received this email within seconds of submitting a ticket. I love the versatility and options, here. It makes me feel like TigerVPN really values me as a customer. TigerVPN’s pricing is also easy to understand and navigate through. The yearly plan is only €6.67 per month, and they have a three years plan that costs just €2.75/mo (about $3.11/mo in Feb. 2019 at the time of this update), and you can access as many as five devices at the same time. Plus, the yearly package comes with additional security features, such as StickyPassword Premium and Shimo VPN Manager. 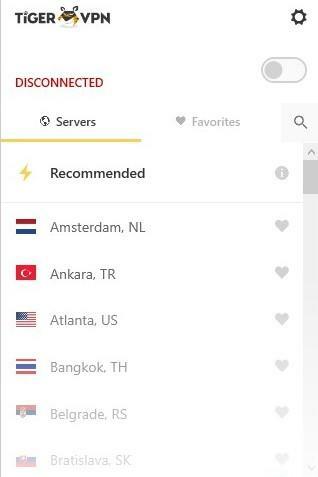 Following The Great Netflix Ban of 2016, TigerVPN assured customers that their servers still worked with Netflix. They even updated a spreadsheet (until October 2017) to help customers known which ones still worked. So let’s see how accurate it still is. We struck out on the first few attempts. For example, we joined a Tokyo server and saw a few foreign titles initially. A good sign! But when I tried to play it, Netflix knew I was using a VPN. Unfortunately, that’s been happening more and more often lately. But fortunately, we were able to get one U.S. server in Denver working. If you’re looking for a more consistent performer, check out the ones at the top of our Netflix list. A few even have perfect scores. TigerVPN has tons of great features. The encryption is wonderful, and customer support is amazing. But there are a few things to watch out for, too. Here’s what TigerVPN could improve on in my opinion. TigerVPN claims to keep no logs of your online activity. Almost every VPN service I’ve seen likes to make the same claim. However, unfortunately, that’s almost always not true. TigerVPN applies the service of a third-parties and will share your info with them based on their function. The company also claims that they may collect the dates on which you connect to their service, your choice of server location, and the total amount of data transferred each day. This doesn’t mean that TigerVPN’s security features are bad, necessarily. But beware that they do collect logs in the background. So you need to be able to trust them with your information. Like every VPN out there, TigerVPN claims to be lightning fast. However, you can’t just listen to every company’s marketing-speak. That’s why I always put them to the test to see how fast their servers really are. I ran speed tests on TigerVPN’s US, Netherlands, and Hong Kong servers to see how they compare to competitors. These speeds definitely aren’t the fastest around. Some, like the US server, are faster than many other VPNs on the market. But overall, I saw really inconsistent speeds from one server to the next. So the performance is kind of a mixed bag, to be honest. One of the best things about TigerVPN is that they offer a 7-day money back guarantee. This is awesome if you just want to try the service out without fully committing to locking in a monthly payment. TigerVPN offers a one-month, six-month, and one-year package. The features are a bit different for each package, too. The one-month package is €11.99 per month. This is a bit more expensive than other VPN services on the market and comes out to €143.88 per year. The one-year package is €6.67 per month. This comes out to only €80 per year, so it’s the best value out of all the plans. The three-year package is €2.75 per month. This comes out to €33 per year. I would recommend trying out TigerVPN for the full seven days before you commit to a plan. That way, worst case scenario, you can get your money back. But on the plus side, if you like it and plan to use it for a long period of time, go with the yearly plan to save the most money. 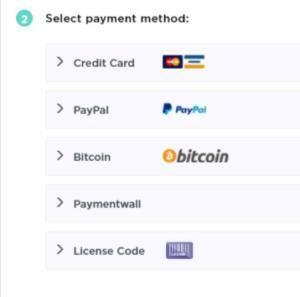 Payment methods include credit card, PayPal, Bitcoin, Paymentwall, and License Code. Now that you know all about the features and pricing of TigerVPN, let’s discuss the pros and cons. To make a proper conclusion for this TigerVPN review, I’d say yes and no. 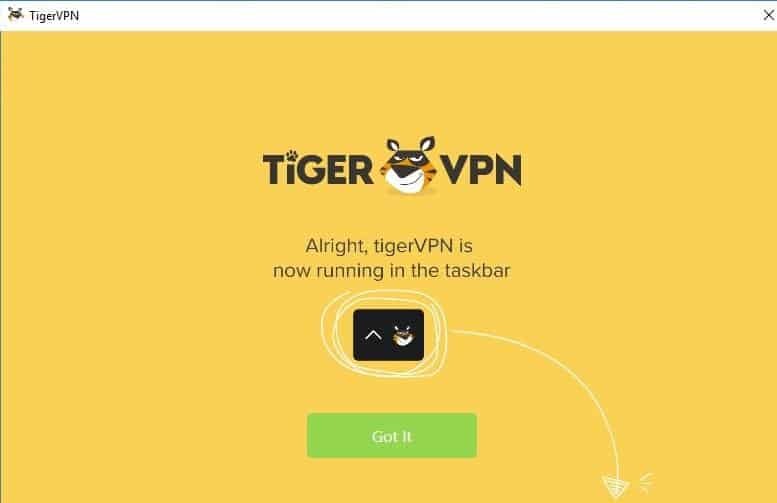 If you’re looking for a VPN that’s simple to use and well encrypted, TigerVPN is a great option. Plus, 2% of the profits from the company go to help animals in need. So you can feel good about giving them your money. Torrenting is allowed with this service… kinda, sorta. What I liked best about TigerVPN is that it’s super simple to install across any device and use. I love that it runs in the taskbar instead of a separate window, too, because you can access the service within any browser. I also appreciated the customer support quality of TigerVPN, too. You’ve got more than one option when it comes to finding an answer to your question. Pricing of the service isn’t complicated, either, and it’s not too expensive considering the features you gain access to. Netflix streaming was successful on one U.S. server. I wish that the logging policy was a bit less sketchy with TigerVPN. Speeds are decent but inconsistent. So you might not get the same experience each time you use the service. And it would also be nice if the company added a few more servers and countries. Overall, TigerVPN gets a 62/100. P.S. I’m always interested in user-reviews so if you’ve used TigerVPN before, don’t hesitate to leave your review below. If your experience matched mine, cool. If it didn’t, that’s fine too! To keep up the quality content on our website, we only accept user reviews that provide valuable information for our visitors. Not all reviews will be published. If you want your review to be accepted, please write a helpful, informative and unique review - either positive or negative. Thank you for your support! I have been using TigerVPN for over 5 years and it's been the best for me. I did a lot of remote access to my company and this VPN was easy to use. I had some hacker friends try to see what I was doing online using "Wireshark" and other Sniffing software and they were unsuccessful in seeing anything other then garbage (non useful data). So for me I find it safe, easy to use and the cost well worth it. Earnings disclosure: In order to get you the cheapest price possible, we’ll earn a commission if you decide to purchase through our links. Thanks for your support.